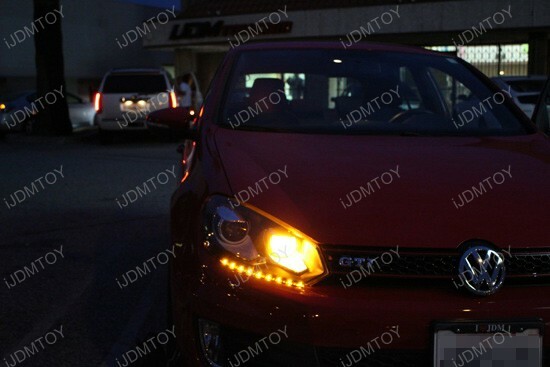 Please stand up for this iconic 2010 Volkswagen GTi and the very nice Switchback LED strips. As far as is known, there are no other products on the market with the same features like this one here. Basically, this LED strip will light up in Xenon White just like the all new Audi A4 or A5 LED DRL and blink in deep and rich Amber color as turn signal lights. Whenever this strip is blinking in Amber, the White LEDs are off until the signal turning is finished. Pretty cool, huh? Each Switchback LED strip has a total of 18 pieces super bright SMD lights – 9 Xenon White, 9 Amber Yellow and is 12" (30cm) long, 0.30" wide and 0.10" thick. This product is ready for exterior use, as it is flexible and water resistant, which makes it suitable for installation on virtually any 12V car, SUV, truck, etc. Installation is totally DIY and not hard at all. Look at the three wires coming from each Switchback LED strip – the red one is the positive for amber turn signal light – tap it to turn signal light’s positive. Then take the white wire which is for the white color light and tap it to existing power source (positive) such as parking lights or side marker lights. Finally, take the black wire, which is the ground and tap it to the negative of some unites like parking lamps. Make sure all wires are properly tapped and secured. You can test whether these awesome switchback LED lights work as they should before peeling the 3M double-sided tape and apply them underneath the headlights or under the bumper. 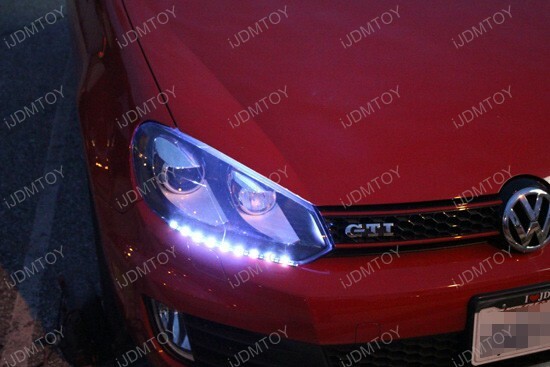 Even if you don’t own 2010 Volkswagen GTi, you can get this great add-on for your car and thanks to the switchback LED strips get some compliments. Give your ride the new Euro cars look with the featured LED lights and enjoy very bright and noticeable lighting output for just a few bucks. This switchback LED strip from iJDMTOY really makes a difference and you’ll definitely won’t regret styling your whip with high quality product like that.